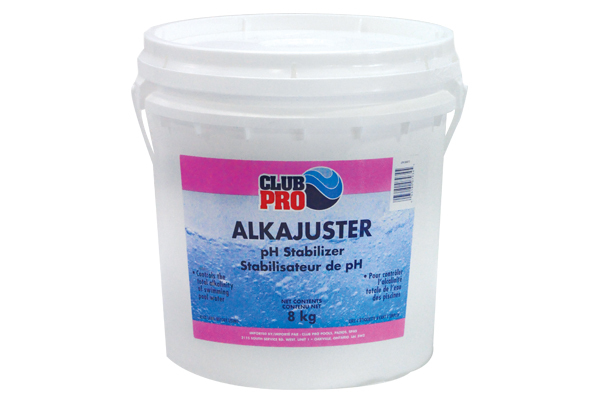 Our Alkalinity Increaser, Alkajuster, is a chemical used to increase the level of alkalinity in your swimming pool or hot tub. Alkalinity is one of the four main levels in your water chemistry. You should be testing the alkalinity each week in your swimming pool or hot tub. The level of alkalinity can be increased using Alkajuster. However, can only be decreased by using Muratic Acid. Alkalinity is an acid/base level that stabilizes your pH. When in the ideal range, a proper alkalinity level can prevent your pool liner from wrinkling. The ideal range for Alkalinity is between 80-120 ppm. When using this product, broadcast it over the surface of your pool, preferably in the deep end. Product can be bought in 2KG, 8KG pails for swimming pools, and also in 750mg containers for spas.